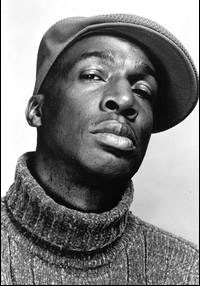 When they announced the 2007 'inductees' to the Rock & Roll Hall Of Fame yesterday, I was amazed to hear they had chosen Grandmaster Flash alongside people like R.E.M. and Van Halen. Flash, unlike the others, was a true pioneer who changed the music forever. He came up out of The Bronx in the mid-70s as one of the first DJs spinning at the very dawn of what would become Rap Music. His techniques were legendary, applying the electronics he was learning at his vocational high school to manipulate the turntables and create something that was more than the sum of its parts. 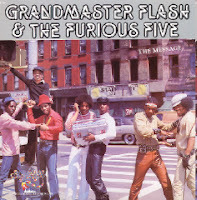 As the 'MC' became an essential part of the music, Flash hooked up with Kurtis Blow for a time before developing the concept of The Furious Five. 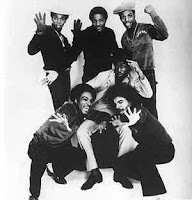 They soon dominated uptown, and by the fall of 1977 Flash had blown by fellow innovators Afrika Bambaataa and Kool DJ Herc as the king of the Bronx and Harlem dance scene. He was also one of the first to experiment with the 'beatbox', and turned the electronic drum machine into an artform. Spoonie Gee, meanwhile, was developing his own 'love rap' style and kept begging his uncle, Bobby Robinson, to record him. Bobby basically just laughed him off until he saw the success that Sugar Hill Records was having with the music. 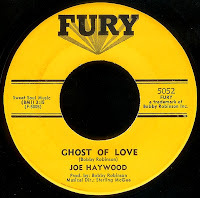 He decided to re-activate his Enjoy label and offered a contract to Grandmaster Flash and the Furious Five. 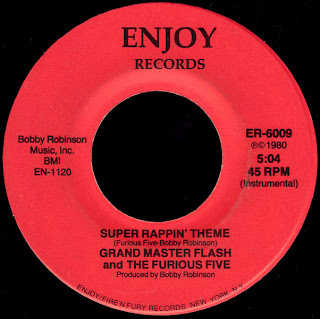 Flash's prowess on the beatbox along with the funky groove laid down by Pumpkin & Friends (Bobby's 'house band') helped make Super Rappin' a big local hit in 1979. Although it didn't get any radio play, Bobby's Happy House was selling over 2000 copies of the 12 inch single a day! 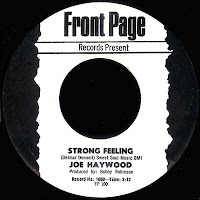 Today's selection, that original backing track, was the flip of Super Rappin' #2 in 1980, and appears to have been the only 7 inch 45 released by Flash. "So what are you saying here, Red... that you're finally happy with the Rock & Roll Hall of Fame?" Originally from Union, South Carolina, Robinson settled in New York just after World War II. 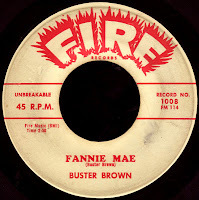 He opened a record store on 125th Street in Harlem, a couple of doors down from the Apollo Theatre, in 1946. Along with his brother Danny, he soon became a fixture in the neighborhood, and was on a first name basis with the performers and music industry types that hung around the Theatre. In the liner notes for the now out-of-print The Fire/Fury Records Story, Bobby goes on to say "I also got to know the fellows who had their own record labels. I remember spending a lot of time with Ahmet Ertegun and his partner, Herb Abramson, when they founded Atlantic Records. They would come up to the store and ask me for advice." 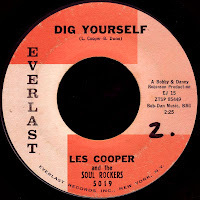 We've already spoken about the circumstances regarding the label's next #1 R&B smash, Lee Dorsey's Ya-Ya. Sehorn and Robinson's southern connections were paying off big time as the record even broke into the pop top ten. His next big chart successes were to come from closer to home, however. Small's Paradise was a legendary Harlem nightspot located just ten blocks from his record store, and Bobby was a regular. 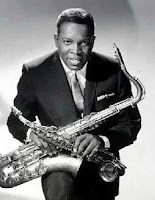 In 1962 he made a bet with the saxaphone player in The Noble Knights that he could deliver him a hit. That is until he started it all back up again ten years later to record the first wave of Rap as it happened on the streets around him. This is a seminal figure, folks. This is the man that ties it all together... the missing link, if you will. He is still around, working most days at his 'Happy House', which (like we talked about a couple of weeks ago) remains an important cultural focal point in the Harlem community. Where is the Rock & Roll Hall of Fame... or the Rhythm & Blues Foundation for that matter? As the Furious Five said on the A side of today's record - "His name is not found in the Hall of Fame." That, my friends, is just plain wrong. Thanks for another great piece about an underappreciated legend, Bobby Robinson. For some reason (a combination of my own ignorance and Robinson's cruel lack of fame), I didn't know that he was behind the Fire and Fury labels until your post. 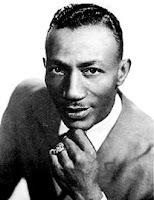 I always associated those labels with Lee Dorsey, not with Robinson. 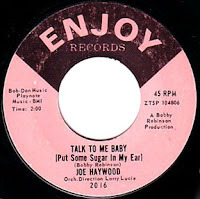 Whenever I'm going through stacks of rank old skated 45s (which these days is never often enough), "produced by Bobby Robinson" is enough to put the record into the BUY pile. 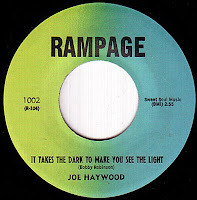 this track has never lost it's energy and uplifting sound ... thanks for posting!! !